Hello Friends, Happy weekend! I am exhausted….don’t know about you all? I thought this week would never end! 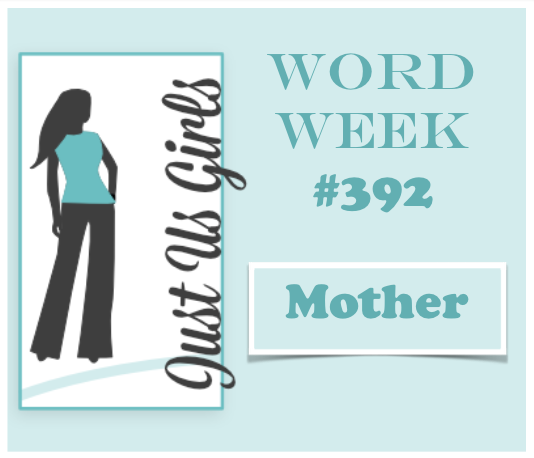 Over at Just Us Girls this week our word is Mother! You are going to have to trust me that the above card is indeed a Mother’s Day card as I forgot to take a picture of the inside. I am not a huge fan of Mother’s Day, having lost my mother so long ago. This card and a few others that I made and failed to photograph…grrrrr…. are up for sale at the local store I have mentioned in the past. The stamp is from Stampendous and the sentiment is one I ADORE from Stampin Up. Categories: Cards | Tags: Card making, Cards, Mother's Day, rubber stamps, stamping | Permalink. So lovely and elegant, Nancy. I know what you mean about mother’s day as I lost my mom 7 years ago this month. Beautiful card. Love the b/w color combo and the lovely sentiment. Have a great weekend. Hugs. Oh how I love black and white cards, but I never seem to remember to do them. This one is amazingly striking and I love the clear design. I too don’t make Mother’s day cards as my Mom has been gone a long time. But this year, I am going to think about it differently and honor some of the wonderful people out there that deserve a special card on that day. I sure hope that you got some relaxation this weekend. The black and white is really stunning. Well done! I love the simple black and white of your card, Nancy. Since I have a daughter who is the mother to two of my grandchildren, I plan to send my card to her. Gorgeous card Nancy! Love the black and white design and I agree with you on the sentiment! It’s a great one! There is just something about a black & white card – always elegant and beautiful and your certainly is that. Love it Nancy. LOVE the simpleness of this card. And I am always a fan of black and white. This is just beautiful, great design and style!!! Lovely card. I really love the black and white very elegant. Nancy, this is gorgeous! I love the dramatic use of the black and white, it is so elegant. I feel the same way about Mother’s Day because I lost my Mom way back in 2004.